GBP 144.00 for UK and EC (including VAT) plus shipping and paypal fee. GBP 120.00 for rest of the World (No VAT) plus shipping and paypal fee. GBP 120.00 each for UK and EC (including VAT) plus shipping and paypal fee. GBP 100.00 each for rest of the World (No VAT) plus shipping and paypal fee. Micpre has 82dB of gain (72dB on micamp stage + 10dB on the fader). Micpre and Line amp stages are transformer coupled and independent with their own seperate inputs/ outputs. Compressors can be linked for stereo operation. These were primarily demo units and have not seen regular studio use. The cases and the top edges have normal rub marks but the front panels and knobs are in mint condition. For details and close inspection please download the high resolution images from the links provided and just zoom in. GBP 1,200.00 each for UK and EC (including VAT) plus shipping and paypal fee. GBP 1,000.00 each for rest of the World (No VAT) plus shipping and paypal fee. On these items I accept payment by bank transfer as it is greatly less than the paypal fee. In which case a bank fee of GBP 15.00 will be applied. Amek Purepath Driver İn Box, Rupert Neve Design. 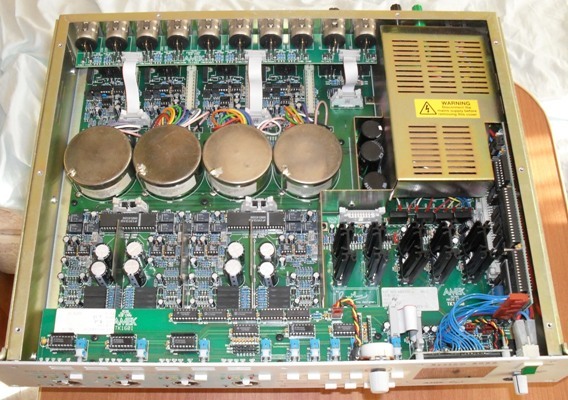 8 channels of fully transformer coupled line amp/driver. Each channel has -3 / +3dB Trim, Phase, Mute, Silk and metering. In/Out connections are through D25 connectors. This was primarily a demo unit and have not seen regular studio use. The case and the top edges have normal rub marks but the front panel and knobs are in mint condition. For details and close inspection please download the high resolution images from the links provided and just zoom in. GBP 1,500.00 for UK and EC (including VAT) plus shipping and paypal fee. GBP 1,250.00 for rest of the World (No VAT) plus shipping and paypal fee. Amek System 9098 RCMA, Rupert Neve Design. 4 channel remote controlled fully transformer coupled microphone preamplifier + Master Controller. Primarily the audio path is all analogue with a full digital front end control where beside the gazillions of other functions you can save and recall the settings of sessions. GBP 1,920.00 for UK and EC (including VAT) plus shipping and paypal fee. GBP 1,600.00 for rest of the World (No VAT) plus shipping and paypal fee.